Having all your bills due at one time during the month can be inconvenient, especially when your pay dates don't line up with your due dates. You may be able to lighten the load on your first or second paycheck by changing your credit card due date to a better date in the month. Having just one or two due dates fall on a different day of the month can improve your cash flow and make your finances feel more comfortable. Changing your credit card due date is a quick process. You can often change your credit card due date with a quick call to your card issuer's customer service line. Some credit card issuers let you change your due date online as well. First, you may have to catch up on any past-due balance before you can have your due date changed. If you're behind on your payments and can't afford to catch up right away, talk to your credit card issuer about payment arrangements or a hardship plan. 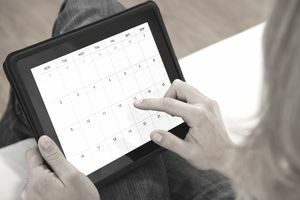 Assuming you're all caught up on payments, take a look at your calendar and your budget and decide which day during the month will be a better due date. If you get paid on the first and fifteenth of the month, you might pay some of your bills on the first and others on the fifteenth. Make sure you think about the amount of your credit card and other bills before you change your payment due date. That way, you won't have all the highest payments due at the same time of the month. Your credit card payment is due on the same date each month, so make sure you choose a date that occurs every month. Since the twenty-ninth, thirtieth, and thirty-first do not occur in every month, those dates aren't good due dates. Call your credit card's customer service department using the number on the back of your credit card and ask to change your credit card due date. They'll ask for your desired due date, then make the change. Some credit card issuers may let you change your due date online. Log on to your online account and look around to see if the option is available. It could take a couple of billing cycles for your new due date to be effective. Continue to pay close attention to the payment due date on your billing statement so your payments are on time. Once your due date change becomes effective, that's the due date you'll have each month. Your first statement after you change your payment due date may have a higher finance charge if changing your due date makes your billing cycle longer for that month. Don't worry. Your finance charge and minimum payment will return to more typical amounts on your next billing statement. If your credit card issuer doesn't let you change your payment due date, you might be able to send your payment earlier in the billing cycle. For example, if your payment is due on the seventeenth, you might pay it with the paycheck you get on the first of the month rather than the one you get on the fifteenth. If you sign up for online billing, you can confirm your payment amount as soon as your billing statement is ready rather than waiting for it to come in the mail. Just be sure that you don't make your payment too early. Otherwise it could be applied during the wrong billing cycle. You can also try changing the due date of another payment, like your phone bill or utility payment. If you change the due date of one of these services, your first payment after the change could include some prorated charges.